Tesla Inc. may have more Model 3 sedans held up at Chinese ports over labeling issues than previously reported, according to a state television broadcaster. A total of 4,678 cars that have arrived at Chinese ports may have issues including misprinted or missing local-language labels, China Central Television said. 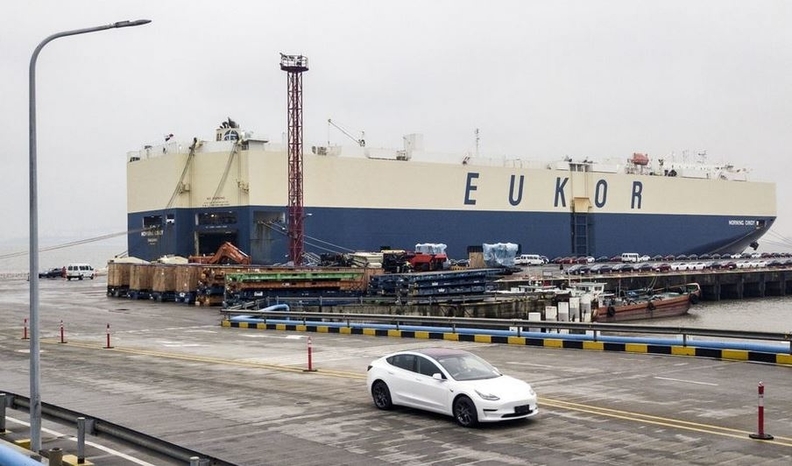 The flaws first surfaced earlier this week when Caixin reported that ports had suspended customs clearance of Model 3s due to problems with about 1,600 cars. Tesla is fixing the labels under the supervision of customs officials, who will resume clearances after they pass review, CCTV said. The company said in a statement Tuesday that sales of the Model 3 in China aren’t impacted and that it continues to deliver sedans that have already been processed. The customs holdup is a setback to CEO Elon Musk’s crucial extension of the markets where Tesla sells the Model 3, the company’s least-expensive vehicle. The carmaker also started deliveries of the sedan in Europe this quarter. Meanwhile, a longtime auto analyst said investors should temper expectations that Tesla will earn profits in China. Morgan Stanley analyst Adam Jonas said he's cautious about the role the country will play in the carmaker’s long-term strategy and fundamental value. Jonas cited Chinese authorities’ decision to suspend customs clearance for Model 3s. Flawed labels have held up the cars at ports and highlighted “the risks inherent in U.S. auto/tech firms conducting business in the PRC,” Jonas wrote, noting the sensitivity of data privacy, cybersecurity, robotics and artificial intelligence. Jonas listed a host of concerns, including Tesla’s reliance on China having “constructive trade relations” with the U.S. American regulations on exports to the country also should be considered, including the Treasury Department’s Committee on Foreign Investment in the U.S., known as Cfius, and the “unquantifiable risks of technology transfer,” the analyst said. Electric- and autonomous-vehicle technology may be regarded as having “dual purpose,” Jonas wrote, which could limit the role of U.S. companies within China’s transportation industry, and vice versa. He added that Morgan Stanley’s China team is aware of dozens of domestic Chinese electric-vehicle startups. Further ahead, Jonas sees the auto industry “morphing into a public transport utility operated as a public good.” That might naturally limit the role of foreign entities, as national and economic concerns come into play. Morgan Stanley rates Tesla shares the equivalent of a hold with a $283 price target. The stock was little changed on Wednesday, closing down 30 cents to $276.24. The shares have slumped since Musk announced plans last week to close most of the company’s stores and shift to all-online ordering.